1. The preparation of compost: use cane sugar with the weight percentage of 1% to 10%, mix well with wheat of the weight percentage of 90 to 99%, put the mixture into hot kettle, then add water and make sure the weight ratio between the mixture and water is 1 to 1.5, heat it till the water is completely absorbed. 2. Filling: take isometric compost and soil into fungus sacks and pots. Soil layer is on top of substrate layer. The middle is separated by aluminum foil or screen window. 3. Sterilization: use pasteurization to sterilize fungus sacks or pots in 121 degrees for 40 to 50 minutes. 4. 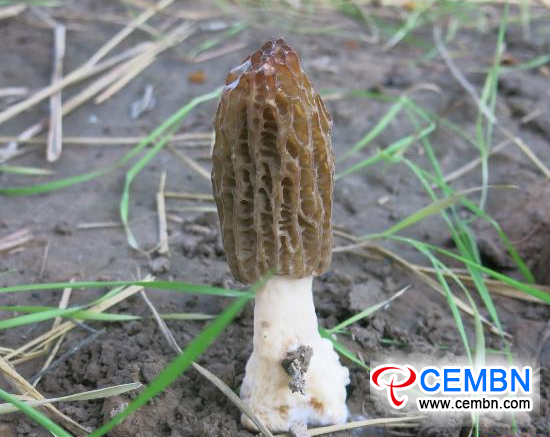 Inoculation: put agar that with the strain of Yellow morel in soil layer and inoculate sclerotium. 5. The growth of sclerotium: keep out of the sun and keep the temperature between 18 and 20 degrees,keep relative air humidity in 75% to 85% and keep the air movement and even temperature. 6. The preparation of substrate: take matured and cracked sclerotium and the optimal selection is 3 centimeters square and round blocks, mingle into the middle of soil and the thickness of soil is 1cm to 3cm. 7. Watering: water substrate and make sure substrate is completely permeated by water. The moisture is saturated and not present “soaking condition”. 8. Even ventilation: keep uniform ventilation for 3 to 4 weeks. 9. Maturity: keep the soil moisture content between 50% and 70%, keep indoor temperature in between 16 and 20 degrees and keep relative air humidity in between 75% and 85%.